A report in The Sunday Times at the weekend stated that 7 out of 10 Britons describe themselves as Middle Class. There were various sub-groups under this banner, but then it went on to name “50 things that make you middle class”. I’ve had a quick scan through and picked out the ones that should ensure your holiday property will appeal to 70% of the British (all written with my tongue very firmly in my cheek I have to point out!). 1) Holiday habits – ideally there will be three trips a year, a cold one snowboarding in the mountains somewhere, another lying by the pool in the heat and a third in Cornwall or elsewhere the UK – sheltering from the rain. Ideally your property will fit one of these three. 2) Veg boxes – something that can be replicated anywhere – it’s called a welcome box. Fill with local produce, wine and foraged items for an added bonus. 3) Ethnic salad spoons – put some in the kitchen drawer of your holiday property. 4) Underfloor heating – very desirable for the winter holiday retreat and ‘sheltering’ (ie rainy) trips. 5) Dinner parties in the kitchen – open plan kitchen/diners are easier to sell and a more sociable space. 6) Bicycle seats for children – probably indicative of general need for child-friendly kit and more active holidays. 7) Festivals – along with the three holidays a year, festivals are inclusive of all ages so have become an integral part of the summer. Link your property up with local ones as a selling point. Often day passes are available and some festival-goers want to sleep under a roof, or at least be sure of a dry night before or after the festivities to recover. 8) Cheese – put a local variety in your welcome box. 9) Threadcount – knowing this and specifying it is impressive, Egyptian cotton is no longer sufficient. 10) Logs – cosy and doubles up as wall decoration. 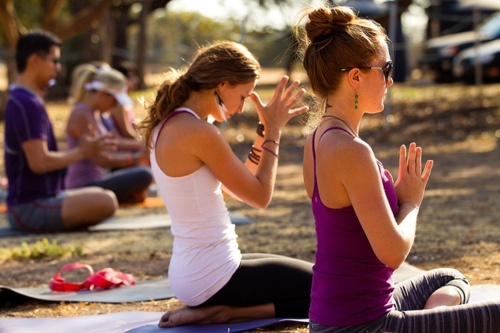 11) Yoga – link up with local classes or better still organise a retreat at your property. 12) Jars (storage) – put a few Kilners in your kitchen. 13) Trampolines – good for child-friendliness and makes families feel at home. 14) Yurts – for those glamping weekends in the UK or rural Spain or France – make sure there are plenty of sheepskins around. If you need to delve further into the nuances of the article and I’ve given you a taste for going the whole hog, you can access it here – although you do need to be a Times subscriber. I hope this snippet might have given you some clues as to why your property is profligate or not, although as I hinted at in the beginning – all to be taken with a heavy pinch of salt! Although sometimes it’s nothing major that’s wrong, just the little things. Happy thread counting. If you’d like advice or help with marketing your holiday property, the team at Rental Tonic would be happy to help. Please comment or Contact our Rental Tonic team directly. 5 Easy Ways to Run a More Eco Friendly Rental Should You Advertise Your Holiday Property Address?